Arletta Root didn’t live very long. Neither did her brother Joel. 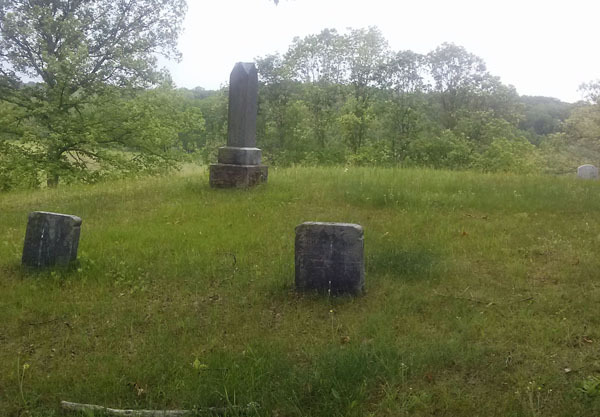 Both siblings lie beneath fading tombstones in a small Clare County, Michigan cemetery on Mullet, about a quarter mile north of Hatton Road and two miles west of Old 27 in Hatton Township. One tombstone that perhaps should be there isn’t: One for the town of Hatton. 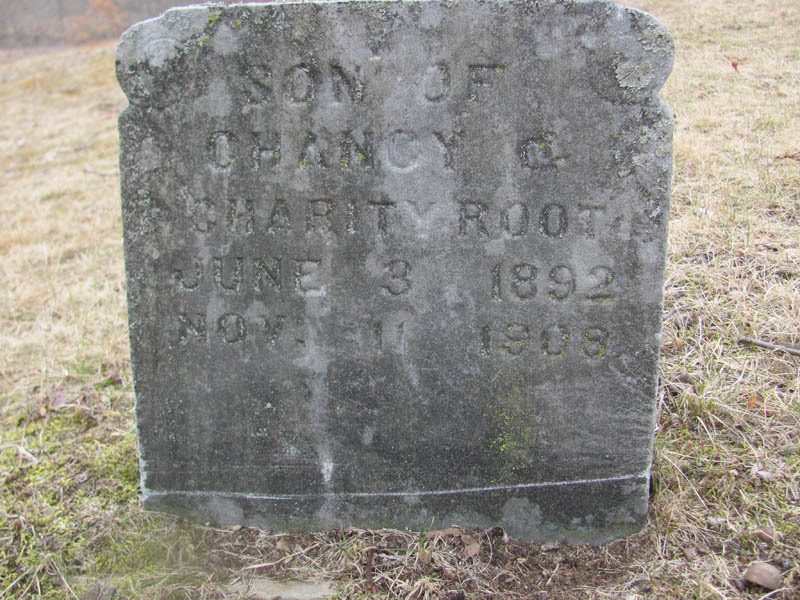 The Root family plot in Hatton Cemetery. The stone of Joel is the smaller one on the left. The stone on the right belongs to his sister, Arletta. No one lies under the large market that just has the family name. Arletta died in 1905 at age 18. Joel, who died three years later, was three years younger when he passed away. According to the death certificates, Joel had been sick for nearly a decade before he succumbed. I could not make out the cause of death but epilepsy is listed as a contributing factor. Arletta’s death was attributed to what seems to read as “coagulation of brain,” which is some type of brain trauma. There was a contributing factor but I couldn’t make that out on the form. Marker of Joel Root. The names of the parents are on the side of the marker. Joel’s name, like the identical one for his sister, is on the top of the stone. They were among 12 children of Chancey and Charity Root, who owned a 40-acre homestead in the township before moving to Franklin township to the north and east. When the Roots moved they left behind two dead children and a dying, or perhaps already, dead town. Hatton was born of the logging era in Clare County. It was not unique in that respect. Towns like Hatton grew where there were people, jobs and transportation, and disappeared when any or all of those disappeared. 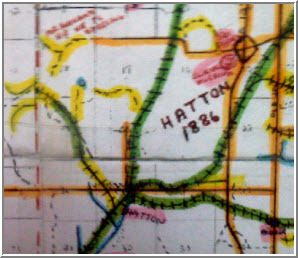 Hatton is the point where the green tracks converge on this map created by Mr. & Mrs.Vanderbrink. The track heading to the north goes to Harrison’ the green track to the right goes through what is now Mid-Michigan Community College and then up to the logging community of Dodge, that was once a booming town with a large sawmill. According to local historian Forrest Meek, Hatton Township had one of the best pine forests in the county with trees that grew tall and straight. Hatton also had the railroad junction where standard width tracks went north to Harrison and northeast to Dodge and smaller narrow gauge logging railroads came in to bring their load of logs to market. 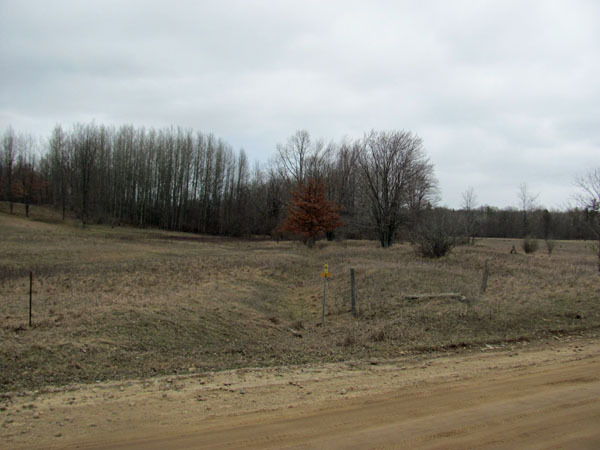 It also was the site of a cattle stockyard, which was needed to help feed the growing number of shantyboys (lumberjacks) and workers associated with the surrounding logging industry, the railroads and numerous businesses that supported them both. 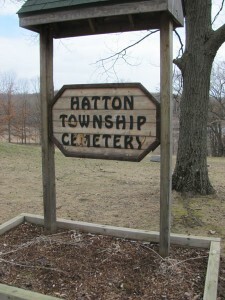 Hatton was founded about 1880 when the Flint and Pere Marquette Railroad pushed north of Clare into Harrison, the recently founded county seat about 11 miles to the north. At its zenith, Hatton had about 200 residents, some of them farmers like the Roots. It was a difficult life for most during that time, but especially for the farmer. The land may have been good for growing pine, but not for much else, consisting primarily of a thin layer of topsoil covering sand. There were also the massive pine stumps that farmers had to contend with before they could built and plow. Within a decade, the pine was essentially gone. And once the pine forests were cut and hauled away, the shantyboys moved further north. So did the businesses that supported them. Even many of the railroad tracks, whether standard gauge or narrow gauge, were pulled up and hauled away and rebuilt where population growth made economic sense. Towns like Hatton withered and died. Fires often ravaged what was left. The raised sections are remains of old railroad grades on the north end of Hatton Rd. In 1910, a fire came through Hatton, taking all that neglect and the weather hadn’t destroyed. Old school house at Hatton and Mullet Roads. Although there are a number of homes in the surrounding countryside, they have a Clare mailing address and Zip code. 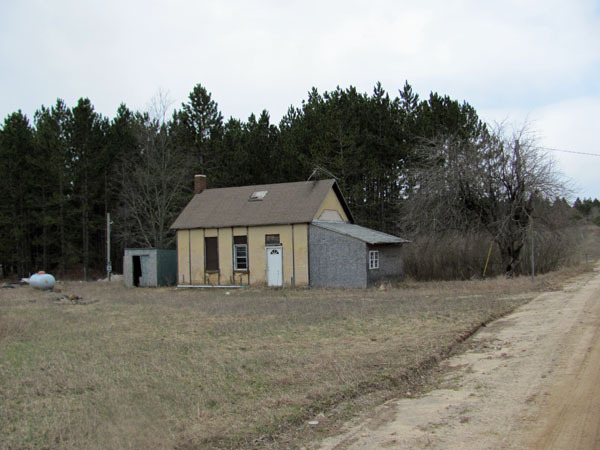 All that remains to show there ever was a town of Hatton, is the east-west road that goes through what was its center, a few barely visible railroad grades, and an old schoolhouse that dates from the early part of the 20th century. And a cemetery on Mullet Road. Let us see what the Clare County Historical Society (clarecountyhistory.org) can find out for you. Stay tuned and I will let you know. Thanks for contacting me.